The Act (streaming on Hulu): Don't be surprised if Patricia Arquette ends up competing against herself at the Emmys this year. Following her triumph as a corrupt prison employee in Showtime's Escape at Dannemora, she scores again as a dangerously delusional mother in this true-crime limited-series anthology. She plays Dee Dee Blanchard, who moves into a Missouri town with her daughter Gypsy (the remarkable Joey King), falsely presenting the trapped teen as a special-needs child. Their twisted relationship culminates in murder in a macabre scenario that plays like Whatever Happened to Baby Gypsy? The series opens with two episodes back to back, followed by weekly installments. If lurid intrigue is your favorite kind of act, you'll likely be hooked instantly. It only gets more twisted as it goes. The actress, who won a Golden Globe for her recent role on 'Escape at Dannemora,' talks the Hulu series and why she likes playing 'unpleasant' people. Bublé! 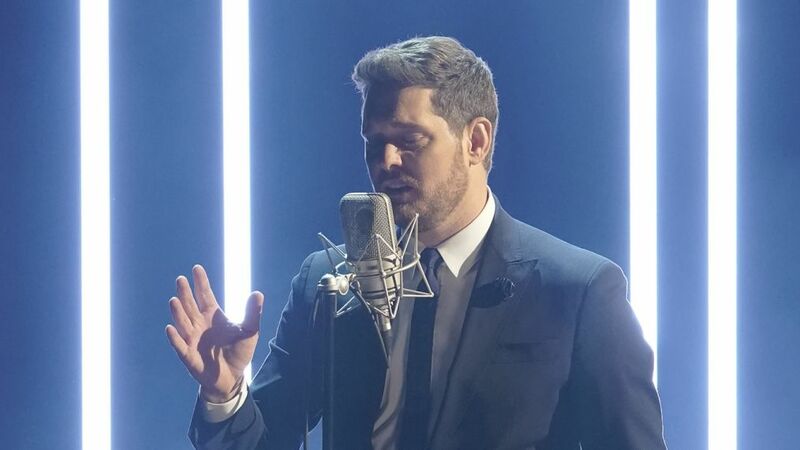 (10/9c, NBC): A welcome throwback to the glory days of music-variety entertainment in prime time, crooner Michael Bublé grooves with a 36-piece orchestra in his seventh NBC music special. He performs from his new Love album and covers standards including "Fly Me to the Moon" — part of an upbeat Sinatra-themed medley — and a moody version of "My Funny Valentine" that almost sounds like a James Bond movie theme. In between songs, he reflects on his charmed life and career and even mocks his limited abilities on the keyboard. As an interpreter of the American songbook, he's hard to beat. Riverdale (8/7c, The CW): Can Sweeney Todd be far behind for the ghoulish teens of Riverdale? Last year they tackled Carrie as their high school musical, and now it's time for Heathers: The Musical — so much better than the failed Paramount Network series adaptation. Naturally, Cheryl (Madelaine Petsch) channels her own inner Heather as the musical's queen bee. Typecasting? SEAL Team (10/9c, CBS): Following two hours of Survivor (8/7c), the military drama returns from a two-month furlough in a new time period an hour later. The second season continues with Jason (David Boreanaz) and Bravo Team working with the Congolese Army on a secret mission to capture the leader of a rebel militia group. And yet Jason manages to find time to argue with daughter Emma (Kerri Medders) about college. Exec producer John Glenn hints at a major development in the pair's budding relationship. Inside Wednesday TV: This was inevitable. Freeform spins off one of its biggest hits in Pretty Little Liars: The Perfectionists (8/7c), in which Sasha Pieterse and Janel Parrish reprise their roles as Alison and Mona, heading to the Pacific Northwest enclave of Beacon Heights and its top-tier college, where secrets predictably lead to murder… Also inevitable: an assignment on ABC's international caper Whiskey Cavalier (10/9c) that forces mismatched agents Will (Scott Foley) and Frankie (Lauren Cohan) to pretend to be married. The mission takes them to romantic Paris, so maybe some ooh-la-la is in the cards? Scrubs' Zach Braff directs the episode… FXX's You're the Worst (10/9c) keeps dropping alarming hints about the impending wedding of Gretchen (Aya Cash) and Jimmy (Chris Geere). And it's hard not to fear the worst as the prospective bride and groom each experience significant professional setbacks mere days before the blessed event.